Adam offers advice to caregivers of a loved one with TBI and/or PTSD — from simply trying to see how that person's life has changed to helping him get involved in confidence-boosting activities. Adam talks frankly about his challenges keeping up with family and friends since his injury; he has good intentions but following through remains difficult. TBI? PTSD? Both? No matter your diagnosis, Adam says that taking the first steps to get help is what will matter most for a successful recovery. When it comes to TBI and PTSD, everyone's recovery is different. But Adam shares three key principles that can be crucial for everyone. Adam shares a message of hope to those diagnosed with TBI and/or PTSD: Your life may be different, but you are still the driver and in control. From taking notes on a laptop during class to using a voice recorder to tape a lecture to review later, technology can help veterans with brain injury succeed in college. Adam shares his first-hand knowledge. 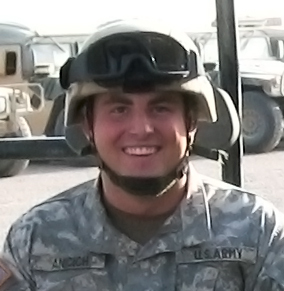 Adam shares his story of how polytrauma care at the VA changed his life after brain injury, including the unintended consequence of wanting to return to college.